Update 10/20 - Nickolaj posted his Dell Right Click tool, so if you’ve take then time to get the Dell API, you should add his tool for individual lookups in the Console. Update 8/18 – Finally received our Production Key. In the Meantime @Geodesicz also modified the script to run in either Sandbox or Production mode. It will try if the Key can be used on Dells production API environment, and move forward if it can, otherwise, if errors, then falls back to the SandBox API. – I’ve pasted the updated Script in below and updated the latest version in the download. Update 7/15 - Working with Dell, found we were using the older API, needed to be using v4 instead of v2 API. Currently rewriting entire Script to use new API calls. Will update this Post once the new script is done and tested with the updated API URL. Will provided updates scripts and Reports once complete. Recently I attended MNSCUG meeting where Jason Sandys presented on ConfigMgr database. He showed his OSD Info Script that would write information to WMI so that you could then capture it with the hardware inventory to report back on additional information. 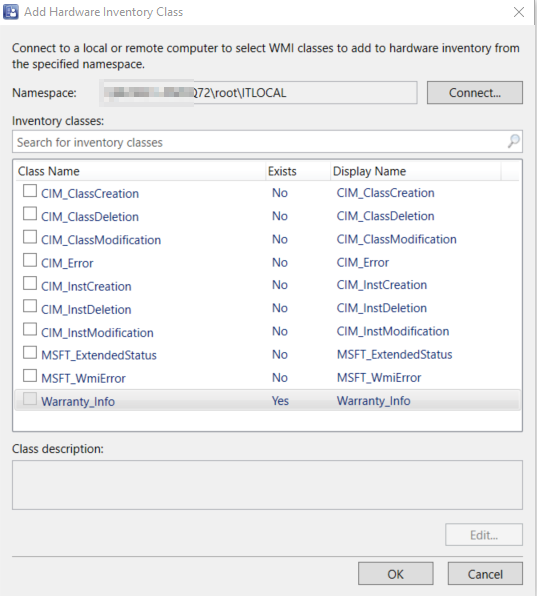 That got me thinking about what else I'd like to have in WMI to report on... Dell Warranty Info! Started looking for a Dell Warranty Script to get me started, found one HERE. Used that to sparks some other ideas. Contacted Dell to get the Dell Warranty API access process started. – https://techdirect.dell.com – Create a ticket, or alternatively, contact APIs_TechDirect@Dell.com. Once you’ve contacted Dell to get the conversation started, you'll have to fill out some questionnaire, etc., but eventually, you'll get your access and own personal API Key. I worked with my friend @Geodesicz (Mark) who is a PowerShell wizard, and he was able to build me the script I wanted. Pulls Dell Warranty Info from Dell's warranty API and places that info into WMI on the workstation. We are using a new namespace called ITLocal, which was already on the machines since we had implemented Jason Sandys OSDInfo Script the week before and decided to use that namespace for consistency. Write-Output "Production API URL failed, switching to sandbox API"
# Does Namespace Already Exist? Write-Verbose "Getting WMI namespace $Namespace"
$NSfilter = "Name = '$Namespace'"
Write-Verbose "$Namespace namespace does not exist. Creating new namespace . . ."
# Does Class Already Exist? Write-Verbose "$Class class does not exist. Creating new class . . ."
Make a Package & Program and push it out to your dell Computers. (remember to have Windows Manage Framework 5 already installed on your workstations). I unchecked everything here, because I only want to apply this to my Dell Workstations. 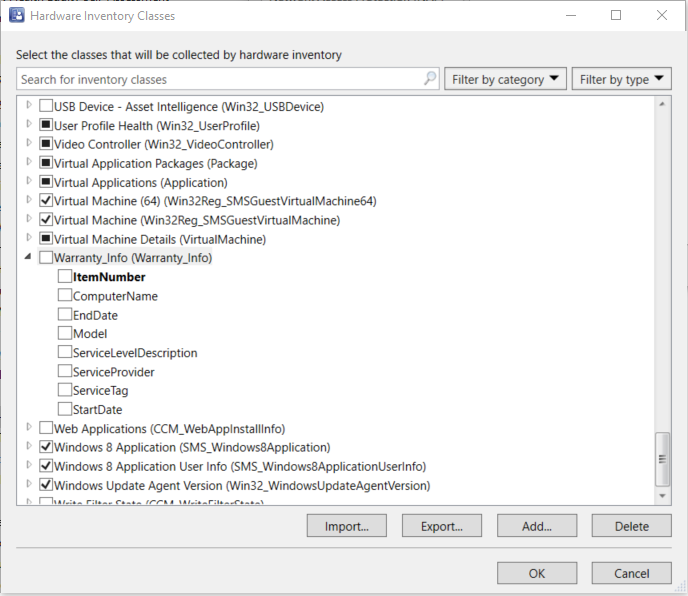 I opened our Dell Client Workstation Settings (We have one that applies only to Dell Workstations, which I borrowed the idea from Mike Terrill after reading this Post about inventory bios settings. 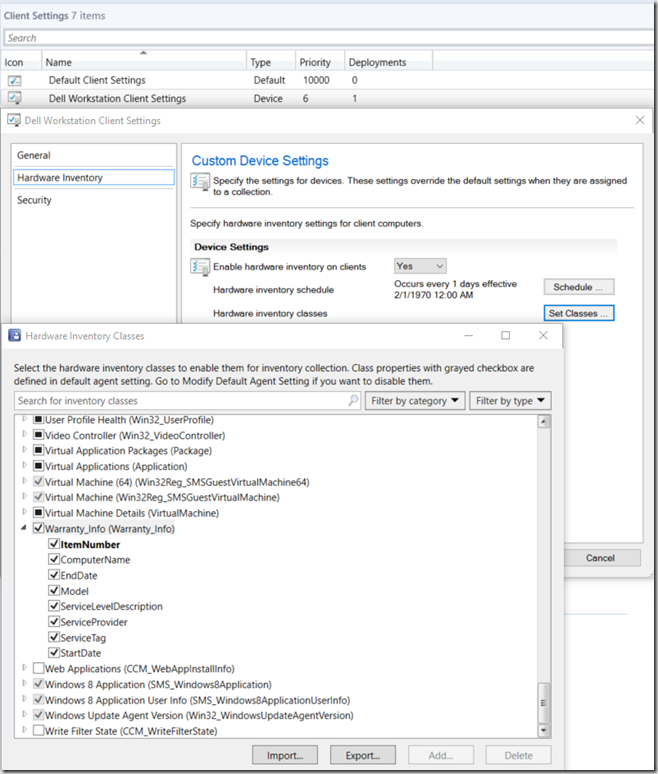 Ok, now wait for your Hardware Inventory cycles to run and the data to populate in your ConfigMgr DB. Ok, Building reports... Fun with SQL Report Builder! Mark & I have created two quick and easy reports for now, just as proof of concept, but will probably find ways to pull this data into other reports as well. You can click on the + next to the computer name to expand if has more than 1 warranty associated with it. We created a new folder called Hardware - Warranty, created our reports there. I've added those 3 reports to the ZIP file you can download with the Script. Just import them into your system, as long as you kept the namespace the same as the one in our script, it should work fine. Update your Data source in each report, and you should be set. I really hope I didn't miss anything, there was a lot of parts to this. Mark will also be blogging this, since it was a joint project. He'll probably have more info about the Powershell stuff itself. 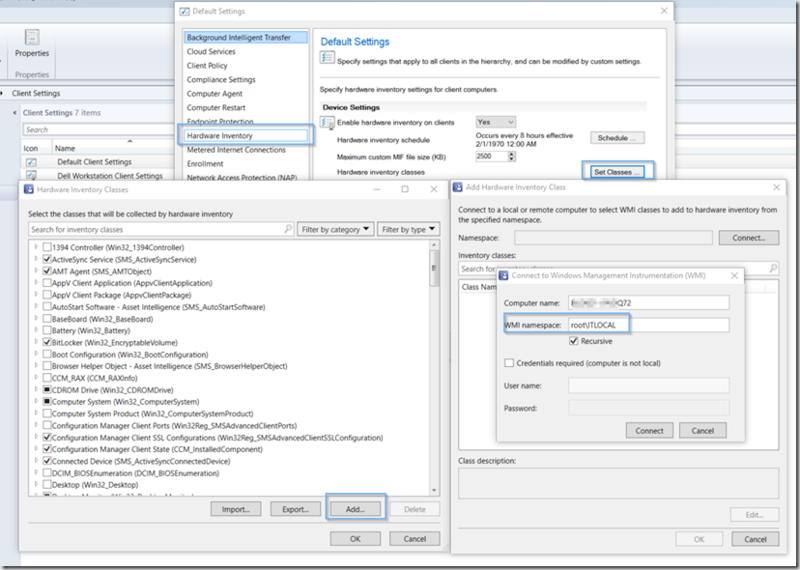 Couple of things to remember... ConfigMgr DB is NOT the same as a Configuration Management Database. When you delete the computer from ConfigMgr, there goes the data along with it. I make sure to tell our management, this data is ONLY useful for computers currently active in our system, we do NOT keep historical data. As always, if you run into any problems, please feel free to contact me, I'll update the Blog to correct anything found. Sometimes its hard to get the proper screen captures after you've already set it up and been using it. Also, I highly recommend checking out Jason's OSDInfo Script & Mike Terrill's Dell Posts, those might help shed some light on what we've done. Very awesome work that you are doing with the script. Came at the right time for me. Can't wait to see the updated script. I requested my API key today. As soon as we get the API info from Dell, we'll update our scripts to use our new API key and test, then post. I'll probably have to rebuild the reports as the v4 API is a fair bit different than the v2 API. I'll keep you in the loop Sid. I have applied and been allocated our API key. What I am wondering... Is it possible to modify the script to output the warranty info directly? As part of our MDT deployment, an automated email is sent advising that it is near finished. As part of the email, it displays the latest AV signature updates, as it's updated as part of the deployment. Plus some other info that the hardware team monitor. Actually, I can just run it as is and call the WMI through powerhsell and include it in the email. Hi, Sorry to be a nuisance. Hope you could assist.? I've added the api key into the script to automate it as much as possible. I'm trying to run it as part of a MDT 2013 deployment, but for some reason, it fails during the deployment. - Giving out blank outouts. It dows create the "ITLocal" class though. If I run it manually during a task sequence pause, it will run fine. Is there a trick to getting the script to run either during an MDT deployment, or is it designed to run from the local drive? Came to the realization that the through MDt and WinPE, it won't have powershell 5 loaded. Hence the reason it won't work. I will need to copy the file locally, the figure out how to run the file during my task sequence and call pwershell from the local C drive. Sorry for delay, been off for a few weeks. Why not wait until later in the TS and you're running from the OS? Then you don't need to worry about the limitations of PE. We run this near the end of our TS. Hey Dean, unfortunately I don't have the means to help with a Lenovo script, we don't have any Lenovo's to test with. I would start by contacting Lenovo Support and asking if they have a warranty API you can connect to. We have HP in our environment, but so far I've been unsuccessful getting any information from HP Enterprise Support about how to get bulk warranty data. It appears there is a company that provides additional ConfigMgr reporting that already has this all figured out though. http://www.enhansoft.com/product/warranty-information-reporting I'd highly recommend going that route, then you have support as well. If this functionality is a value to your company, then it should be an easy sell to get them to go with a product like Enhansoft. Can I use this script to pass a Serial no and get the warranty details only? 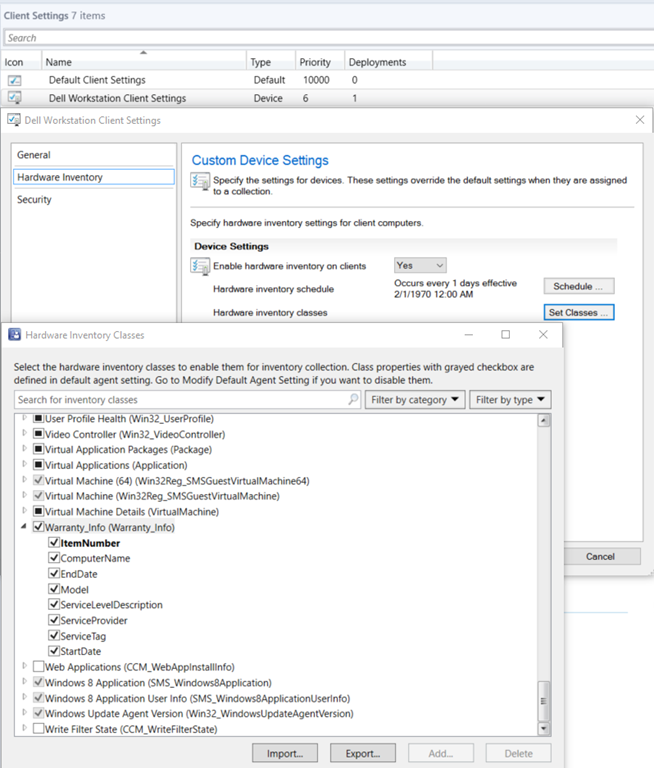 I don't want to use the ConfigMgr. Will really appreciate if you can help. I can easily modify it for something like that. Are you wanting to do this one at a time or in bulk? Nikolaj Anderson is working on making something like this with a standalone GUI as well, but I believe that will do them one at a time. Let me know what you need. I don't mind taking a few minutes to make some changes. I'm not familiar with this tool you reference. Making something to pull from a CSV or something should be pretty easy. The second part is what concerns me. This thing wrote it directly into the ConfigMgr database? Was it a custom table or something? I don't like to write directly to the ConfigMgr database. That's not a best practice. I could write something that exports the name and warranty info into another CSV file. I'm working on another script right now that pulls data and writes it into a SharePoint list which I could possibly merge with this as well to do it that way. That might take a little longer, however, as it is not the highest on my priority list at the moment. First, I just wanna say thanks! We've just received our API Key from Dell, and are trying to pull warranty information down for easy access, and - unfortunately for us - I'm the closest thing here to a 'programmer.' Suffice it to say, we were in over our heads. And, the internet is not exactly brimming with solutions, so this was a bright, shining beacon of hope and salvation. I was just curious, though - are there any permissions requirements for this script to successfully write the values to WMI? After doing a test, I'm seeing that the Namespace, Class, and Properties are all getting created; however none of the values from the API Request are getting written to the properties. I have confirmed that Powershell v5.0 is installed, and the GET returns the data, I'm just not sure why it isn't then written to WMI. Thanks Seth, it was nice working with you offline. Using Powershell or the CoreTech WMI Explorer will show the proper results in WMI. Hi and thanks for putting this together. I have a couple thousand Win 7 machines that I want to pull the warranty info for. Being that it needs at least .NET 4.5 to work, and also WMF 5, I was thinking about making a package to deploy all 3 (.NET, WMF, and the script itself) each with a dependency on the last. If I can deploy one package, it will cut down on all of the administrative hoops I'd need to jump through. I'm a bit new to the deployment world so I wanted to see if using a package like this sets off any alarms you can think of. Thanks again for sharing the knowledge. There's plenty of merit to taking the slower, but more thorough route. My org isn't necessarily known for being fast. On top of that, I can't tell if the deployment actually runs on each machine at different times, or if the reporting back to CM is what makes it look that way. Is the "Digitial" typo intentional? The "digitial" part is intentional on our end due to a typo on Dell's end. Dell has a service called Dell Digital Delivery where you can purchase software with your machine and then later download said software, this also includes certain free applications that may come with it. 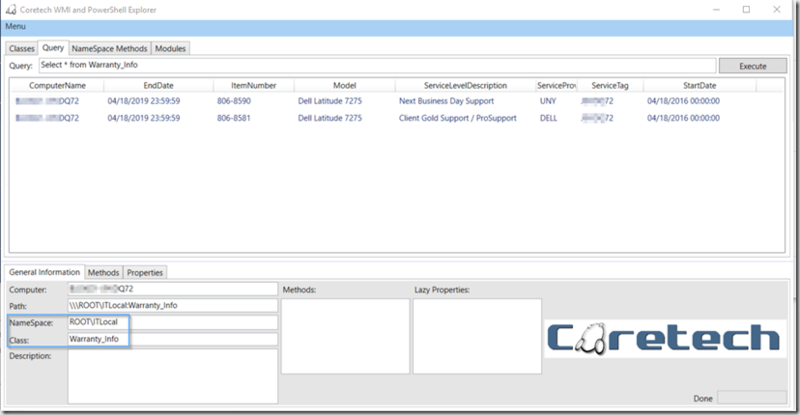 If you run that part without the where filter, it will show you a number of items where the ServiceLevelDescription is "Dell Digitial Delivery". I don't know if this was a typo when creating the API itself, or if it relates to a database or application issue. Either way, the script's filter is based on the string returned from Dell's API query. Does the command line need -NonInteractive or -ExecutionPolicy Bypass, or anything else? Hi - thoughts on whether a modified version of this could pull system configuration (CPU, RAM, etc) in bulk? If you use Report Builder, you can modify or create a new report with any fields you want. I'm not sure how to update the data source for these reports. In the URL path to the reports, there are 2 data sources shown after the report folders. One looks to be the same as yours shows above (AutoGen__5C6358F2_4BB6_4a1b...) and then there's another one. Should I be using one of these, or should I be selecting something else? ll.Commands.InvokeRestMethodCommand	RunPowerShellScript	5/5/2017 12:35:51 PM	3904 (0x0F40). The script will need direct access to the internet to pull the info. Otherwise you'll have to modify script to incorporate proxy. While im sure that's possible, we've never had to set that up. But I'm not sure where to put it in the query below. Any help would be huge! Would you be able to add the Ship Date information to this? It is part of the information you can get from the Dell warranty API call. It is a good way to get reports on the age of your computers for life cycle processes. Hey Jeff, the last I tested the v4 API, it didn't have the Ship Date, however if when you run the code and you're getting a ship date, you should be able to just add a couple lines to record that as well. Look at the "Start Date" for example, you should be able to copy how that was gathered, and do the same thing for Ship Date. Is this script still valid today? I tried to run it manually with powershell and i get errors. I haven't tried in a couple years, I'll try to test when I get time... if I can find my old API key. 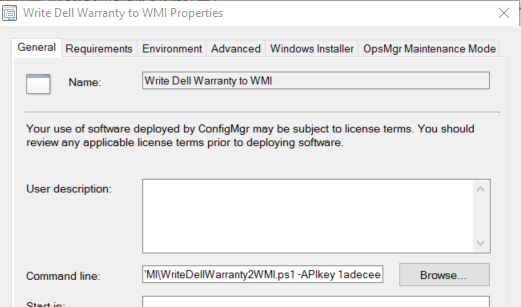 You've tested your API key and making connections to Dell's Portal with PowerShell Directly to see that you can pull down your Warranty info? From your error, looks like it's not getting that info from Dell. seems there was a problem with Dell API at the time, it worked an hour later. do you have a more modern way of dealing with Dell Warranty now maybe? No, this is probably one of the few ways you can do it for FREE, if you want to pay someone to do the leg work, Enhansoft has some nice reports. Give feedback to your Dell Rep that they should supply an easy way to do this. Alrite, ill check them out, wasn't much commercial hits when searching for "Dell Warranty SCCM", so yours was the best hitratio.. 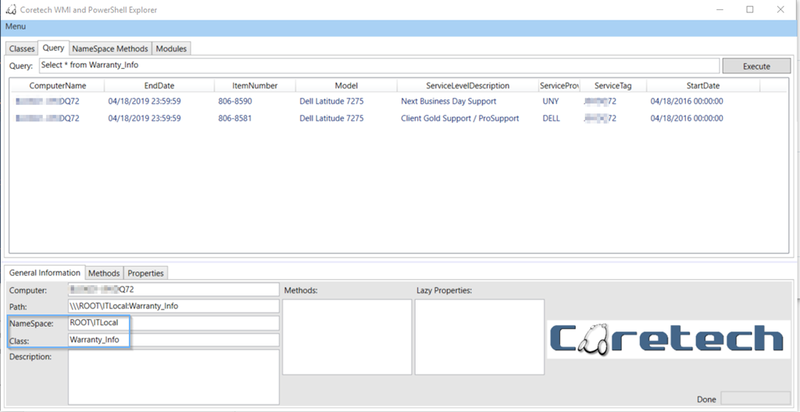 I have tried Dell many times in regards to their Dell Command Configure system, dont know why they create a system that can inventory sooo much info and not a single report to assist with it.